Welcome to another edition of Tombstone Tuesday. Today we’re jumping states from Missouri to North Dakota and jumping families, as well, from my maternal side to my paternal side. Located just over an hour west of Fargo, North Dakota and 15 minutes west of Lisbon, Anselm is a small unincorporated farming community. I’m sure if I was able to go to one of the local libraries or a genealogical society in that area I’d be able to find some history on Anselm but not having had the forethought to do that before I started my blog and not having the time now to head back up there to look I had to settle for what I could find on the internet. Piecing together what I’ve observed with what I could find on the internet (which, obviously right now, is purely my theory supported by a few facts), Anselm was a small community of people, probably from the German/Russian region of Europe. This theory is based on the names in the cemeteries and the fact that my paternal family resided (and still resides) in that area. It’s a strongly Lutheran/Catholic area and active farming community. It also has some connection to the railroad community. Currently the Canadian Pacific Railway has a network location there (it was rather interesting to see on their network location map that they also had locations in Enderlin, Fingal and Valley City which are all names I remember my father and grandmother talking about). 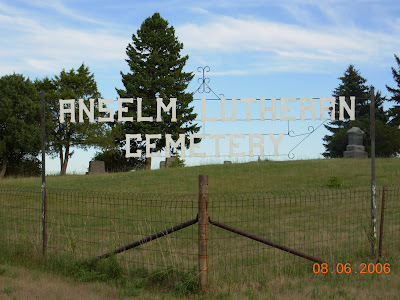 Years ago, as a child, I was introduced to Anselm Lutheran Cemetery and told that I had family buried there. A few years ago, while in North Dakota for a family reunion, we re-visited Anselm and I realized – WOW! I really DID have family there. Over half the cemetery has some connection to my paternal family, whether direct line or distant cousins. My visit there was enlightening to say the least. So for the next few Tombstone Tuesday posts I’ll be highlighting those family members who are buried here. 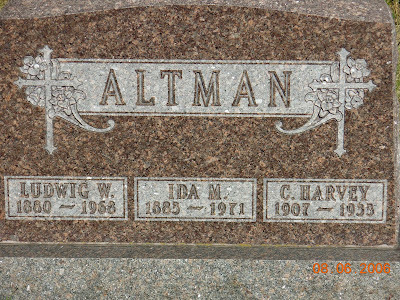 So today’s tombstone belongs to my paternal great-grandfather Ludwig Wilhelm Altman. Ludwig was the tenth of thirteen children of Julius Ferdinand Altman and Marie Louise Henrietta (Froemke) Altman. He had four brothers (all older) and eight sisters (five older, three younger). 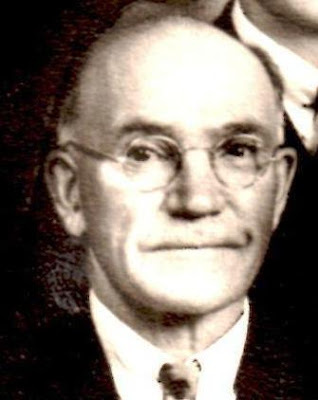 Ludwig was born 12 May 1880 in Shenford Township, Ransom, North Dakota and died 22 August 1968 in Lisbon, Ransom, North Dakota. He is buried along with his wife, Ida Marie, and son, Clarence Harvey, in Anselm Lutheran Cemetery in Anselm, Ransom, North Dakota. The cemetery borders what used to be family farmland.